Namco Bandai’s updated the Tales of Graces f page on their official website tonight. The publisher’s filled out complete story and feature information, confirming a PlayStation 3-exclusive release. How far can the bonds of friendship be strained? The newest entry in one of the most fanatically followed series today, Tales of Graces f redefines the fantasy RPG genre with its blend of enthralling depth of story and fast paced, strategic battles. A follow-up to the original Tales of Graces (Wii), Tales of Graces f boasts significant graphical, stylistic, and gameplay enhancements, along with an all-new epilogue to the existing story. Taking place on the planet Efinea, Tales of Graces f centers on Asbel Lhant as he seeks the strength to protect those he holds dear. Along with his childhood friends and the mysterious and innocent Sophie, he must explore the bonds of friendship as they find themselves drawn into the conflict between three kingdoms competing for dominance of the planet. 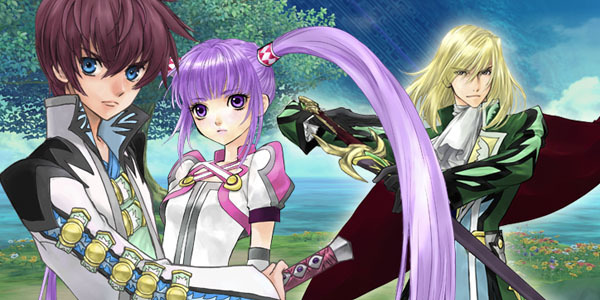 Experience all-new content exclusive to the PlayStation® 3 – Go deeper into the story of Tales of Graces f in the all-new “Lineage & Legacies” epilogue, featuring more than 10 hours of engrossing gameplay. Explore new dungeons, fight fierce new monsters, and wield newly created spells, attacks, and techniques! Stunning Visuals – Enhanced HD graphics and improved outlining to bring attention to the detailed anime art style by renowned Tales artist Mutsumi Inomata. Beautiful and spacious environments allow players to explore a truly open world. Master New Combat Styles – Use the “Style Shift – Linear Motion Battle System” to freely switch between fighting styles and deftly evade enemy attacks. Activate “Accelerate Mode” to use powerful new techniques and bring the fight to enemies like never before! Unique Multiplayer System – Enlist the help of up to 3 friends to fight by your side! Players can join the battle at any time simply by plugging in a controller! Oddly enough, it still says “Coming Soon!” under platforms, in defiance of the features confirming a PlayStation 3-only release. A release date is still to be announced.